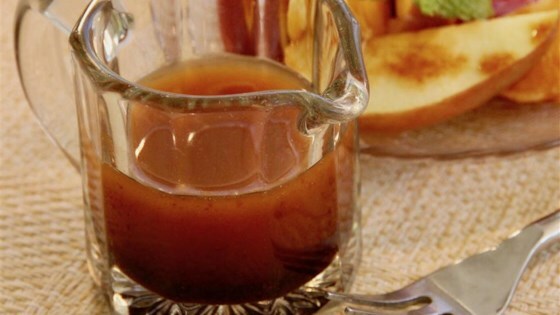 "A great salad dressing for summer vegetables. Keeps well for about a month with refrigeration. Slight separation is normal." Simmer cherry juice in a saucepan over medium-high heat, stirring frequently, until the juice is reduced to about 1/2 cup in volume, about 20 to 25 minutes. Remove from heat and pour into a bowl to cool to room temperature. Pour reduced cherry juice, red wine vinegar, and white vinegar together in a blender; add mustard, chile-garlic sauce, salt, and pepper. Blend for 30 seconds. Add a drop of grapeseed oil and blend another 30 seconds. Pour remaining oil into the blender; blend for 2 minutes. Made this with spring salad topped with fruit, candied pecans and cheese. Very yummy! !